This recipe for gooseberry fool from Waitrose is very easy, particularly as it uses ready-made custard! Gooseberries have done well this year and we have picked some of the bigger fruits to make this pudding. 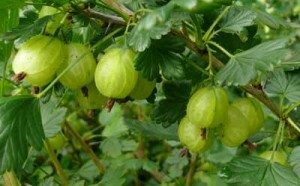 Cook the gooseberries in a saucepan with the water over a medium heat. Simmer for 5-10 minutes until the gooseberries are very soft. Purée in a blender (affiliate link) then press through a sieve to remove the pips. Stir the sugar into the sieved purée, and leave to cool. Whip the cream until it holds soft peaks, then fold it loosely into the custard. Loosely fold in the gooseberry purée so the fool has a marbled texture. Serve chilled, in small glasses. This gooseberry fool recipe would make a good pudding for a special occasion.